We know you’re interested in seeing some TSSPro sealants results! We can talk about the product and its use all we like, but you want to see the change with your own eyes. Why wouldn’t you? Well, our before and after results are amazing, and our testimonials are just as great. We want to show you what the people are saying about our great product. Look at that difference! But what exactly happened here? Well, all the dark splotches you see in the first photo were caused by mold and mildew. Gross! This had to be carefully removed by professionals. 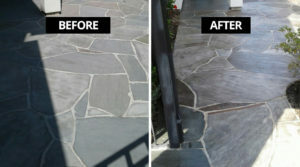 After the stone was cleaned, we added TSSPro natural limestone sealer to protect it year round from all kinds of damage. What a renovation! 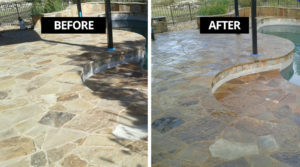 This flagstone patio was treated with a color-enhancing sealant. While beautiful, that is not its only function. Bare flagstone is vulnerable to elements. It could become flooded with water, grow mold, be damaged by the sun, and more. As you can see in the photo, the flagstone is next to a pool. 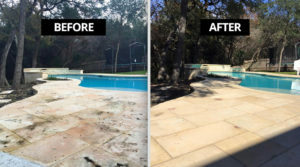 Over time, the pool chemicals would damage the flagstone. Sealing it was the right choice! The bluestone tile on the left was unprepared for rain, sun, temperature change, and foot traffic that would have left it eroded and stained. Just like the flagstone above, this bluestone could have been a host to mold and mildew as well. The TSSPRO-300 WetLook stone sealer was used on this patio. The color contrast is better and it now has a lovely shine to it! This stone is now protected from damage. On our website, we showcase our best reviews for you to enjoy. As if the results above didn’t speak for themselves, our satisfied customers also have something to say about it. Let’s hear it from them. Saurabh Gupta is a general contractor specializing in hotel renovations. They say, “Other sealers like bull’s eye shellac were requiring 2 coats of their product to seal the stone tile…TSSPRO-500 only required one coat and rendered the tile resistant to any coffee or red wine stains, despite keeping the tile soaked in coffee and red wine overnight.” Even after soaking in it overnight, the TSSPro sealant prevailed! As you can see, the experts have nothing but praise for this wonderful product. These are professionals who need to have only the best to keep their customers satisfied. Surely, they know what their best option is. Do you want to achieve results like you saw above? Don’t hesitate to contact us about our products and our qualified contractors. You can call us now at (888) 958-0556 or visit us at 2425 West Loop South Suite 200, Houston, TX 77027. For further questions about our products, interest in more results, or to see our other blog posts, visit our website here.